Machine Gun Shoot at ARPC! 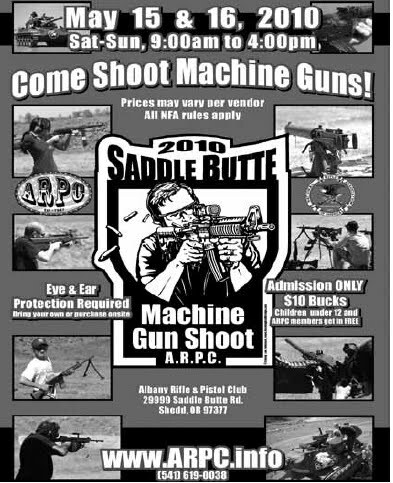 The Saddle Butte Machine Gun Shoot is May 15th and 16th. Every year we get larger and better and it takes a lot of volunteers to make this a safe and enjoyable event. Volunteers will be needed to serve as Range Officers, balloon/target setters, tee shirt sales, setup/take down (Friday 14th and Monday 17th) and gate/parking lots. Anyone interested in helping please contacted Allen Eriksen at Eriksenor@aol.com (weekends phone 541-967- 4005). Please include your full name, phone number and days volunteering to work. This is a great way to get your work bond hours. Don't worry if you have little or no experience with Machine Guns. We will teach you everything you will need to know to help out. You, of course, are not likely to volunteer to help out unless you are a member of the Albany Rifle and Pistol Club. On the other hand, you should know that this event is taking place (happens every year, once in the Spring and once in Autumn) and that it is a heck of a good time. ARPC members enter for free. All others, it costs the majorly big cost of FIVE (5) BUCKS! 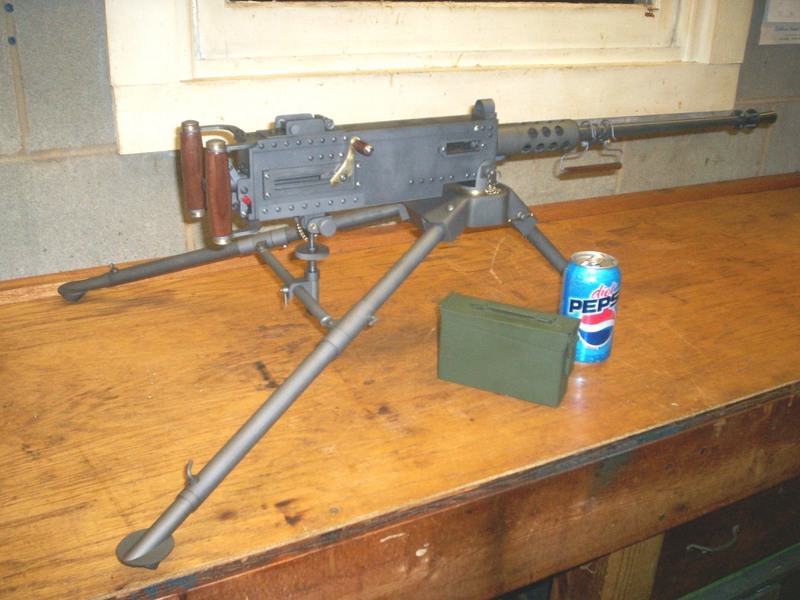 Belt fed, weighs about 18 pounds, fires at a rate of about 600 rounds per minute. Belt fed, weighs about 100 pounds, fires at about 450 rounds per minute, effective range around 2,500 yards. No, I can't guarantee that either will be there. I can only say that in past events, they HAVE been there. What does it cost you to shoot it? My understanding is that you have to pay them for the ammunition. Which would probably be a lot less expensive with the M-60 than with the M-2. Whether there is an additional fee required, I can't say You'll have to go see it for yourself. Personally, I'm planning to go just to get some really good pictures of people having a good time. 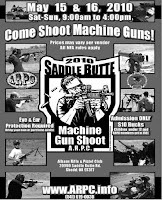 And yes, if you have not ever shot a full-auto machine gun before, this is a good opportunity. Oh, and there will be sub-guns there, too. We're talking the venerable tommy-gun and the m3 grease-gun, for starters. I have seen members of the Full-Auto club bring these to the range, as well as MP-5's. Go here for more information, including directions to the range. I've finally got rid of all the nasty commercial comments from the guy who wanted to sell me laptop batteries. It wasn't cheap. I had to actually BUY the ECHO comment moderation software. That required me to reset my PAYPAL account password ... but at least I was able to review my payment history, always good to know. And I blocked the user. And his IP. And flagged everything he ever sent as SPHAM (deliberately misspelled, so it wouldn't trigger your computer filter). And then I deleted all of his comments. I suspect I may have deleted some of the comments in my history, too. Or at least, my sidebar section where I display the most recent comments no longer display. Sorry about that. I hope I didn't lose too much. And I hope the display will begin working again, as soon as I get more comments. There's a lesson here, and that is -- I can't start a blog and then let it sit without maintaining it. A Geek's Lot Is Not A Happy One, to steal a line from "The Pirates of Penzance". Because I have been so involved in work, and SWMBO, I haven't been involved in other things that I love. Examples include blogging, and shooting. I've got back into the shooting stuff by instructing the "Intro to USPSA" classes at ARPC every month (regularly, instead of 'often'), and making it a point to compete at the ARPC match every month. But even though the two activities should -- and do -- provide material for blog articles, I haven't made time for that, either. So I've taken the weekend for "Me Time", with a list of things to do. The first item on the list was to reclaim my Blog, which I have just done. The second was to pay bills. The third was to write some of those great articles I've been thinking about. But heck, I wasn't going to do that this weekend anyway. You may note that the 'recent comments' section of the sidebar contains the same message, over and over. Apparently someone has built a blogger-attach program for base material purposes. It has attached the same commercial message on at least 50 individual articles, and until more 'unspammed' comments are submitted the roster will be unchanged. I have to say that this is the consequence of ECHO, which replaced Haloscan (even though I had not wished it to, and that's another story), which does not recognize me as administrator. I'm working on that, but even if I regain control over my own comment module, there doesn't seem to exist an option for me to mark the sender or the comments as SPAM ... either as a class or individually. This is what comes of not maintaining the Blog. At this point, I'm just about angry enough to shut it down permanently.